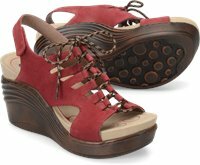 This modern sport fusion sandal offers complete comfort with a fully adjustable fit in a cool ghillie-inspired design. Love the platform type heel it is stylish but comfortable shoe, which is important. However, the Velcro on the back straps need to be longer on the leather strap, in order for you to have a tighter fit if needed. I found that my straps slip on the back of my heels a bit too much, but over all this is a very comfortable shoe & I like the look. I do tend to adjust Velcro strap often trying to elevate the slipping. I love these sandals. They were comfortable from day 1. I wish you still had the brown in my size. I hope you're keeping this model or something very similar in height as a classic of your line. I'm from Canada so it took a while to get my sandals. I had to have them sent to a friend in Arizona then had her send them to me since you don't ship to Canada. It was worth the wait but pricey with the money change and the shipping all in all. If I could I'd buy them in every color. I also have the passion in red and love that too. I won't go any lower in heel than those. Thanks for a great product. Call me a nut but these shoes fit so comfortably, add sufficient height and look so sharp on that I bought them in 4 different colors. I love them! I recommend. This is my second summer season in these shoes, and they are still my go-to pair of sandals for comfort and style. I am able to walk everywhere in them, and I love the extra height without having to suffer for it! These shoes are awesome! Great height and yet so very comfortable. I have 3 pairs in 3 different colors I love them so much! I get compliments just about every time I wear them. Tall yet stable and comfy and so stylish my millennial daughters want to steal them! No wobble, able to walk with my ‘tennis shoe’ stride in these! Low foot incline, flexible lace up top, adjustable heel and supple leather meant no suffering. (I have bunions, high arches, Achilles bone spur). Fun to wear! Fun ALL day! First day out - no blisters or pains! Like wearing an athletic shoe! Love, Love, Love these sandals. So comfortable and stylish. Even my husband commented on how great they looked! last year i bought a pair of "stream" i couldn't believe how comfortable they are. I've been looking for another pair, but i hate paying retail and i couldn't find them anywhere! then i found these on sale....i bought them! i wish i could find a retailer in my area that sells them, cuz i would buy more. I love these shoes!! Bionica Sirus ! My favorite style!! "It's cute , fit width, good confort; excelent arch support and very stylish"! I loved!! I haven't worn these yet, but they seem extremely comfortable. They look great, too! I thought they might be too high, as I usually don't wear anything higher that 2.5 inches. But the pitch is moderate and they feel very stable. My sister wears hers often and gets around just fine, including uneven surfaces. So I figured I could do the same. The orange-y color is really nice--not too bright and will go with a lot. I'm glad I have them! This shoe was exactly as advertised on the web site. I am recovering surgery to repair my Achilles' tendon and got these so I could wear one sandal on my right foot, to balance out the huge platform medical boot on my left that I will wear all summer. It's perfect. I thought it was going to be just too small for my usual size 7, but I think it's perfect. The leather has stretched a tiny bit. It stays securely in place, doesn't slip, bind, bite or chafe. Footbed texture is very comfortable. I would never make a sandal with a light colored footbed because they look dirty eventually, but that's my only complaint. I wouldn't have bought these for looks, but they are very cute on and I have gotten compliments. I wear a lot of cargo pants and shorts and black tanks and the pewter looks fashionable and funky with them. Im very happy with them. I will literally be wearing the right one almost every waking hour for 10 weeks or so, so I hope it still looks good when I can wear the other one with it! O.M.G! Just buy these shoes. I suffer from excruciating foot pain due to neuropathy, broken bones and bunions. These shoes are fully adjustable, down to the last lace on the toes. I wanted a little bit of height, and this shoe is amazing, right out of the box. Worth every penny! I would have bought the red and the blue and the orange if they came in an 11.. ????????? ?I have enough beige and black sandals , ....however I do love the fit of these sandals. Great fit and very comfortable. I wish Bionica made a professional looking shoe . I'm not a fan of the "wave" on the sole but the sandals are super comfortable! Absolutely love these! Comfortable from the moment I put them on. Wore all day with no issues. And very stylish too. I liked them so much, I bought them in another color. Just the best, I’m order other pair. these are the most comfortable shoes!!! I have an ankle that is fused with metal plate/screws, and I just broke the other ankle in february, but I put on these shoes, and wore them all day, and was comfortable and pain free all day. so then I ordered 4 more!!! This style is my absolute favorite! Fantastic fit and comfort from the first minute you put them on to the moment you remove them at the end of the day! Very stylish and goes with casual to dressy outfits. True love! This sandal looks so cute on my feet, I can't help but keep looking at them! People literally stop me and ask where I got them! And not as high heel as it looks, and the arch support is dreamy!